Antonio Rudiger has come to the rescue of his club team mate and striker Alvaro Morata after a section of Chelsea's supporter appeared to turn their back on their record signing during Wednesday clash with Arsenal at Stamford Bridge. 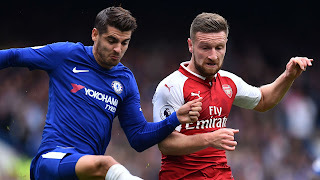 Alvaro Morata have not been in good form of late and yesterday display against Arsenal sum up a run of bad form for the former Madrid man, but fellow summer recruit Rudiger is adamant the Spanish Striker is still contributing to the team, despite his lack of goals. "As a striker it's normal that you want to score. Of course there are times when the head is down a little bit," He told Evening Standard. "But all I will say to him is to continue, to work for the team as he always do and the luck will come again. I'm not worried about him." "I don't know this (if the home crowd were getting on his back against Arsenal). I just know the whole team is with him and I think all the fans are with him." It's just a difficult period for him and I hope the best for him. Sometimes there are spells when you score and don't score, but his effort for the team is good and he always tries. If he scores again, everything will be fine." "Can he we win the second leg against Arsenal for us? Definitely. We saw it in the last round against Bournemouth. He had one chance and scored. When he does this again, everything will be okay."